The Volkswagen Atlas took families by storm last year when it arrived on the scene to offer a generous three rows of seating, peace-of-mind thanks to the Volkswagen People First warranty, and cutting-edge, family-friendly technology. The 2019 Volkswagen Atlas near Mobile AL will continue offering seven-passenger seating with 20.6 cubic feet for cargo behind the rear seats. That can expand to up to 96.8 cubic feet of cargo space with both rear rows folded down. Dual-zone climate control is standard on the 2019 Volkswagen Atlas, and it will be available in seven trim levels: S, SE, SE with Technology, SE with Technology R-Line®, SEL, SEL R-Line®, and SEL Premium. S model will have a starting Manufacturer’s Suggested Retail Price of $34,095 with a $995 destination fee. Keep reading to explore some of the new and returning features that will continue offering Atlas families premium value. 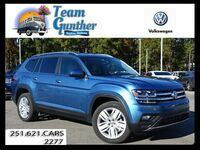 While the Volkswagen Atlas has always provided great value for large and busy families, it is offering even more premium content right out of the gate for the new model year. 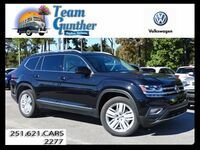 The 2019 Volkswagen Atlas near Mobile AL available here at Team Gunther Volkswagen will now come standard with Front Assist (which includes collision warnings, automatic emergency braking, and pedestrian detection), Blind Spot Monitor, and Rear Traffic Alert. The base S trim, and all subsequent trims, will also add new automatic headlights, rain-sensing wipers, and heated mirrors. SE models now include tri-zone automatic climate control, while SE with Technology upgrades include 20-inch aluminum-alloy wheels, a garage door opener, and a panoramic sunroof. The elite SEL models now feature built-in navigation, the Volkswagen Digital Cockpit with a configurable display, LED taillights, and a heated steering wheel. VW Atlas models will continue with the standard 2.0-liter four-cylinder turbocharged engine rated for 235 horsepower and 258 pound-feet of torque (with premium fuel). A 3.6-liter VR6 engine is also available on all trims with an engine output of 276 horsepower and 266 pound-feet of torque. Towing on the 2019 Atlas will range from 2,000 pounds to 5,000 pounds depending on the powertrain. A trailer hitch may be required as an optional add-on. 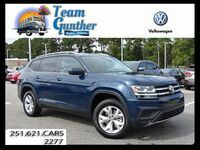 Would you like to learn more about the standard and available features of the 2019 Volkswagen Atlas near Mobile AL? This model is likely to be arriving at Team Gunther Volkswagen before the end of the year. Contact our team, or request more info below, to learn more.